Few places in the world have the population of giant horseshoe crabs that New Jersey does–it is a mecca for the ancient critters, who like our state’s sandy shores for breeding, feeding and happy daily living. 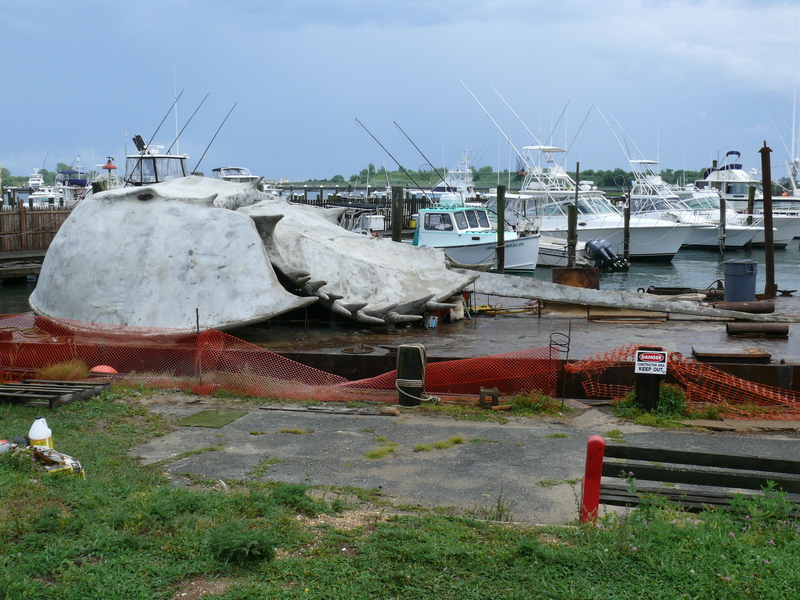 However, now a truly giant horseshoe crab–47 feet long to be exact–has moved in to the Brielle/Mantaloking area. 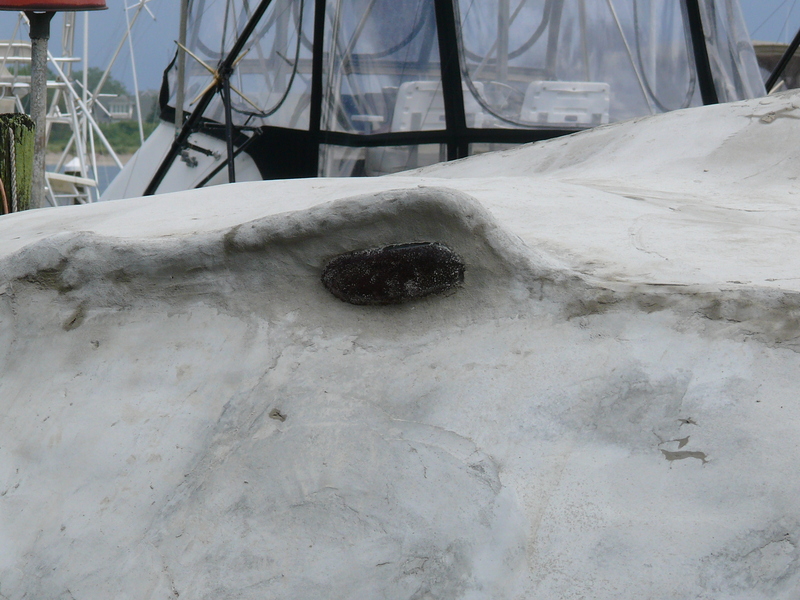 The $96,000, 25,000 pound concrete sculpture, designed and constructed by Point Pleasant artist and SCUBA instructor Christopher Wojcik, in partnership with the Blue Ocean Institute, is temporarily situated on a barge in a Brielle marina. We visited the giant crab while it was still above water and it was a sight to behold. No crowds, little fanfare, just a 12+ ton crab on a boat, and super cool. 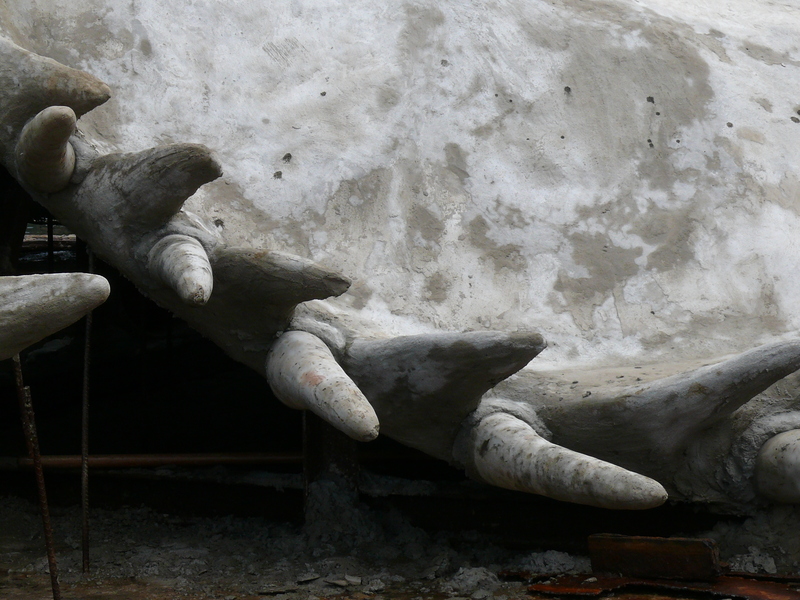 As part of a program called Art as Reef, it was due to be sunk three miles off the shores of Mantaloking on July 25 but was delayed due to weather and still awaiting deployment as of this writing. The crab, which will hold the Guinness World Record as the largest underwater sculpture in the world, will serve as an artificial reef for more than 150 species of marine life. Another feather in the New Jersey cap! 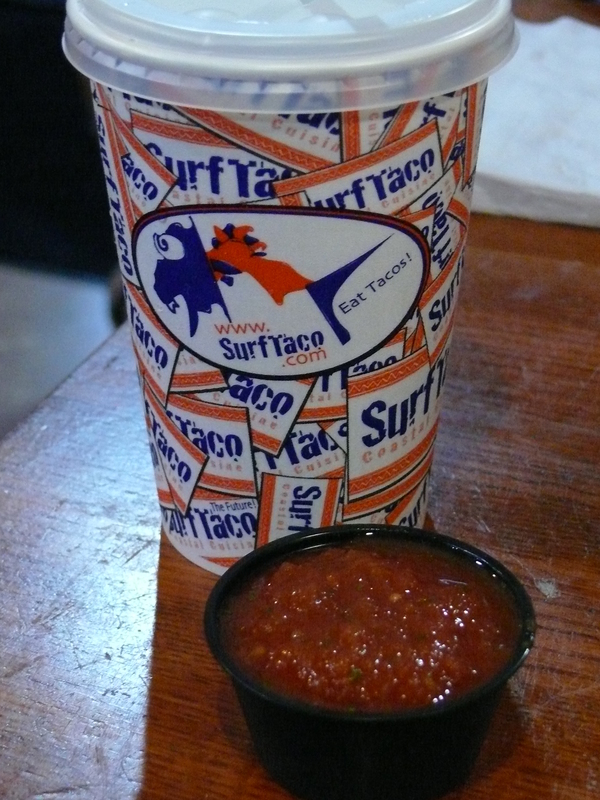 A NJ-only chain with 10 locations in and around Monmouth and Ocean counties, Surf Taco quite simply has delicious Mexican food. The menu includes all sort of traditional items such as burritos, enchiladas, tacos, salads, etc., and a variety of daily specials. The salsa bar exceeded our expectations in a very pleasurable way–the mild salsa was addictive, the salsa verde was delectable, and hot salsas were HOT indeed (ie: not for the faint of heart). We visited the Belmar location on a darkened and stormy afternoon along with hordes of damp and bikini-clad beachgoers escaping the rain for a tasty lunch. The atmosphere is beach-shack casual–perhaps a little too casual, as we do wish there were a shirt required stipulation for dining in… Ordering is done at the counter, where service was friendly, and brought to the table based on a number system. The wait time was reasonable and allowed us the opportunity to raid the salsa bar multiple times even before our food arrived. Our meals were fresh and flavorful, and prices were fair. Would definitely return, especially on a less humid and rainy day with fewer patrons and more clothing. In 1734, the site of the Walnford Estate was a working gristmill. 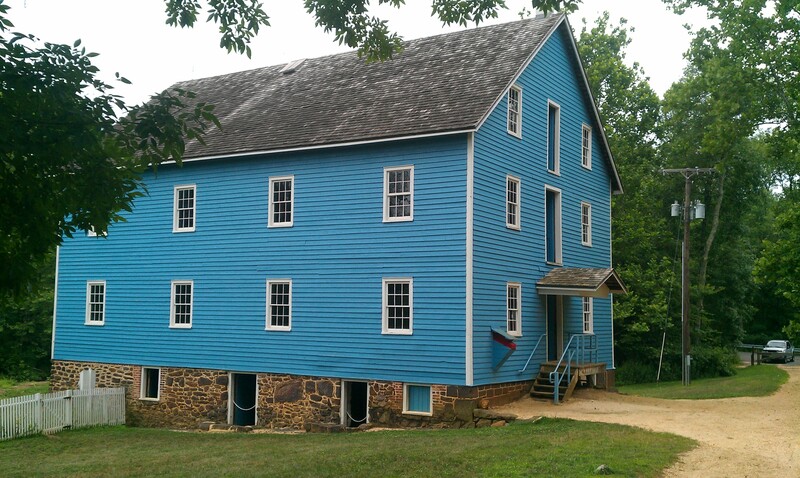 A Philadelphia Quaker named Richard Waln saw an ad for the property in a 1772 newspaper, and was compelled to buy its grist mill, saw mill, fulling mill, blacksmith and cooper’s shops, a large 2-family brick house, five tenant houses, farm buildings, 100 plowed acres and two orchards. 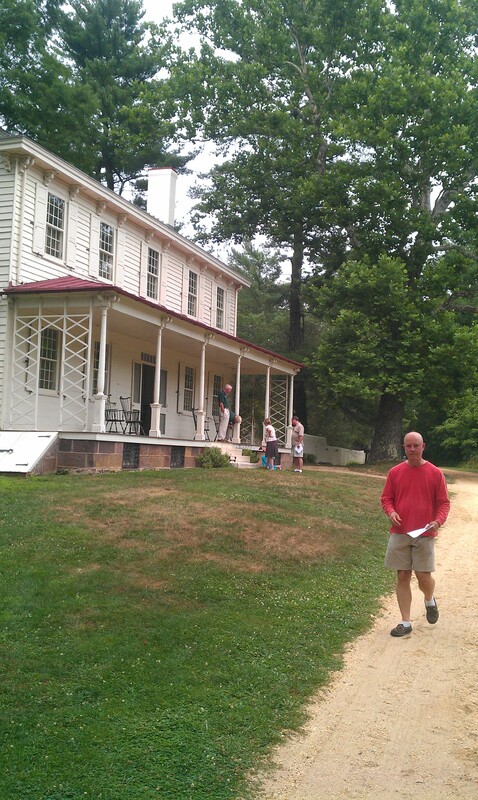 He renamed it Walnford, constructed an elegant home and moved in with his wife Elizabeth and children in 1773.
west. They sold off some of the acreage and focused on redesigning the home, adding a post office, rebuilding the mill after a disastrous fire in 1872, and adding the current carriage house and cow barn. The property stayed in the Waln family and was transformed into a quiet Colonial Revival estate until it was sold after 200 years of occupancy to Edward and Joanne Mullen who lived in the home and ultimately donated it to the Monmouth County Park System in 1985. We toured the main house, learning interesting details such as the nature of the original flooring, paintings of the residents, operation of the old-fashioned kitchen, the sleeping quarters and arrangements, and eyeing the original period antiques. We also walked through the carriage house and stables (“some” of us are apparently 14 hands tall), and visited the grist mill, which, we determined would make one cool apartment in modern day. An antique car installment was on display, but we were too late to see anything of consequence and focused instead on the free tour, friendly guide and serene grounds (that we wish we owned). The park system holds programming on site–ice cream making and eating, tea parties, educational seminars etc.–and there are fully usable picnic tables on the grounds. 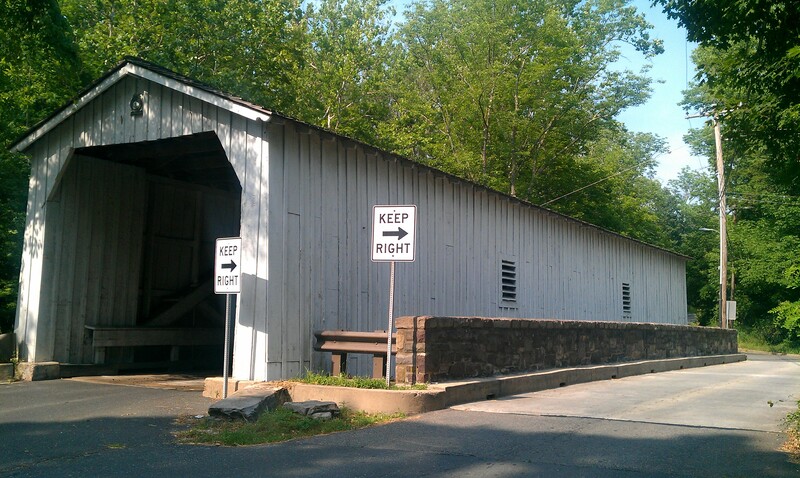 There used to be a load of covered bridges in NJ, but now there’s only one left–in Delaware Township. 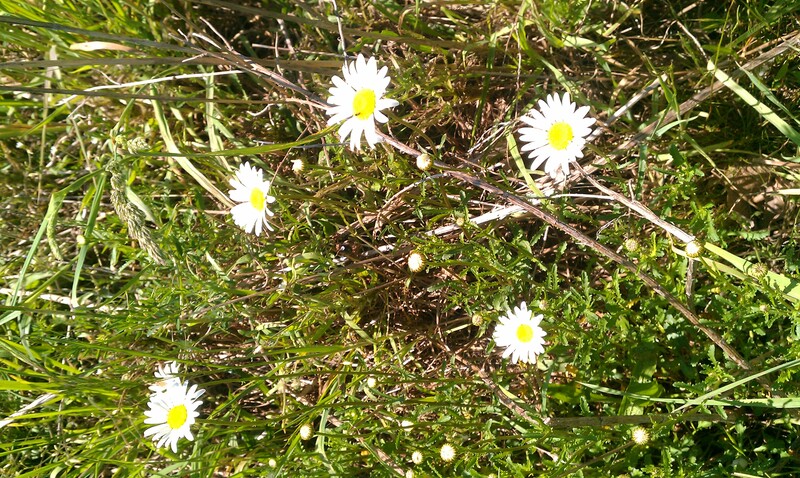 It is pretty cute. 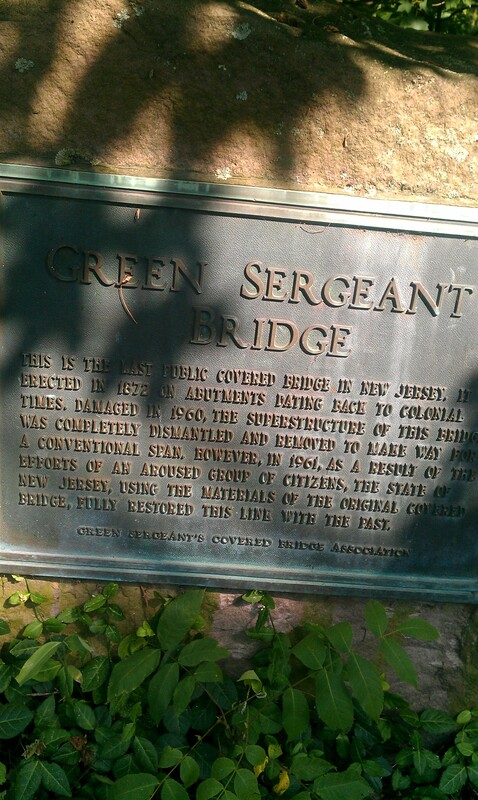 It is called Green Sergeant’s Covered Bridge, and it has quite a history. In the days of horse and carriage, drunks from the local tavern would stop their horses right in the wood structure, thinking they were home, and go to sleep. Now it welcomes motorists and cyclists traveling westbound over Wickecheoke Creek on Rosemont Ringoes Road near Stockton (a regular concrete and stone bridge accommodates eastbounders). 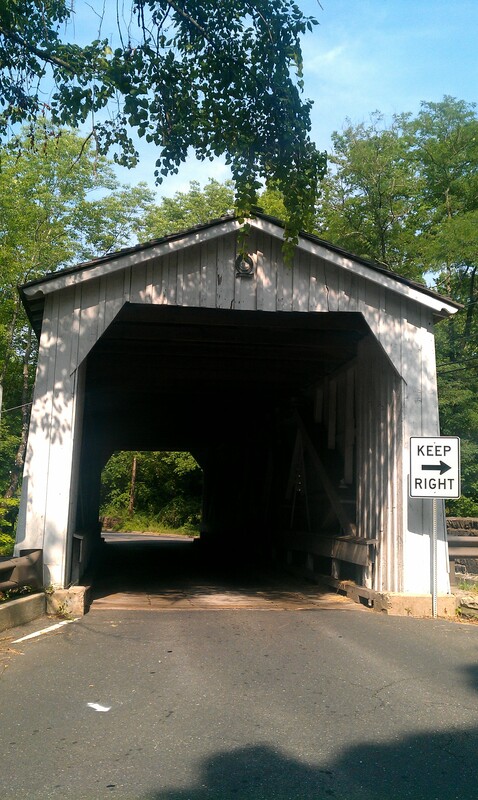 The bridge, named after local mill operator Richard Green Sergeant, was erected in 1872 during the administration of Ulysses S. Grant, and totally rebuilt in 1961 using its original materials. Important note: the pronunciation of the bridge name is “sir-gent” not “sar-gent.” Locals will laugh you out of town if you get it wrong. We exclaimed with glee when we finally came upon this bridge, since we weren’t sure exactly where to find it. After driving over the 84-foot covered span, we pulled to the side to take photos, read the historical plaque and, ok, swipe some rocks for the garden from the dry streambed (shh). As the lone remaining of its kind in the state, this bridge is a non-negotiable stop for all Newjerseyologists. 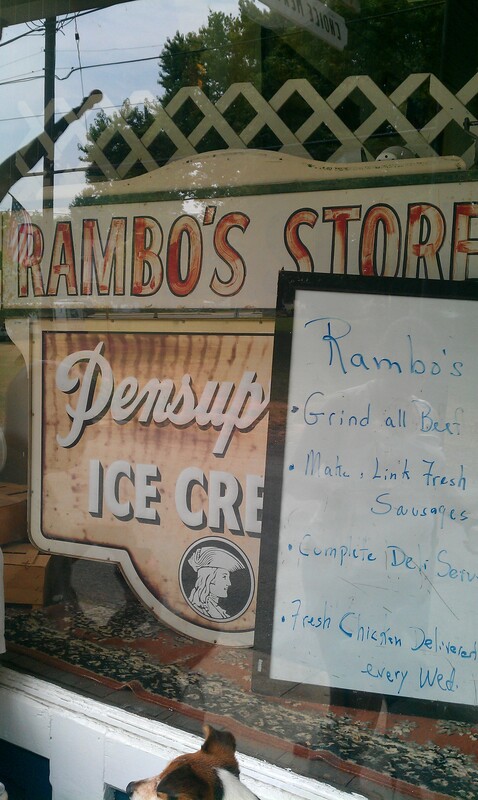 Andy Griffith may be gone, but the spirit of a bygone era lives on at Rambo’s Country Store in Califon. It is, no doubt, an odd stop for a group that is 2/3 vegetarian, as its main claim to popularity is as a meat counter. However, even the more herbivorean of us enjoyed a trip to a different time at this unusual find. Touted as “not a convenience store,” the store showcases meats, deli, homemade dinner specialties (chicken pot pies are a mainstay and the store says they sell 60 per week! ), and grocery items in a old-fashioned general store setting. 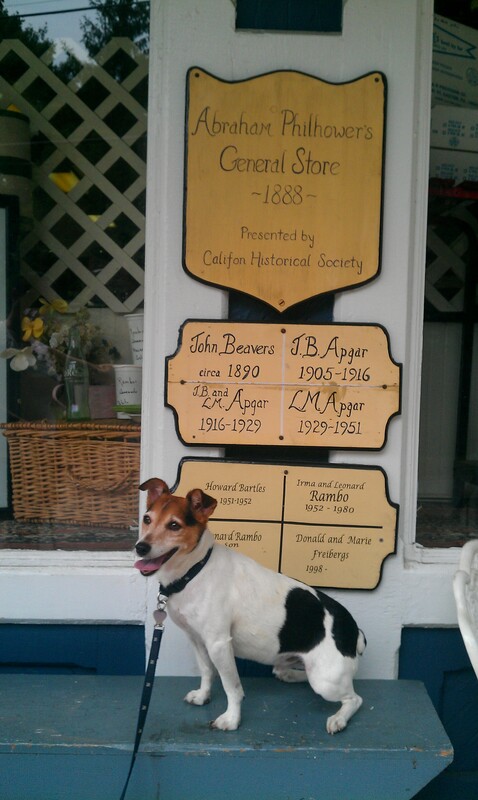 The store was built as one of the town’s three original general stores, by Abraham Philhower in 1888, and it has been in continuous operation ever since. It was sold to the Apgar family, who owned it for almost 50 years, and then taken over by the Rambo family who ran it for another 50 years (the butcher shop section was added during this time by Leonard Rambo, Jr.). 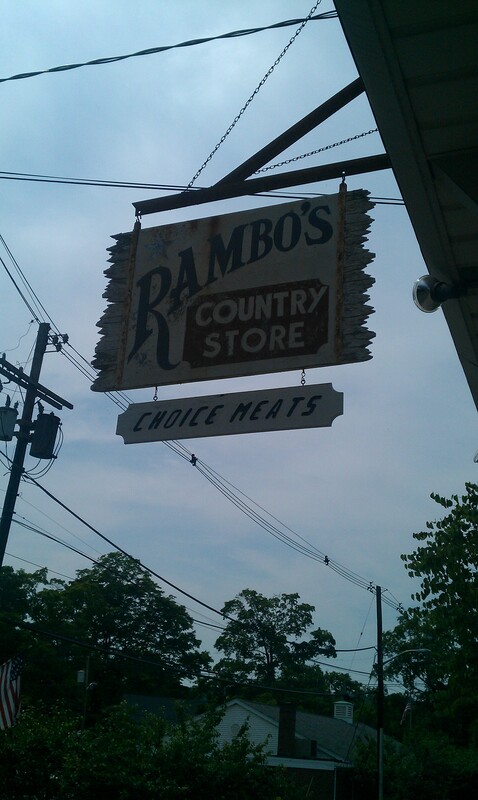 The store is now owned by Donald Freibergs, who was born and raised in Califon, and worked stocking Rambo’s vegetables shelves before and after school when he was only 10 years old. He and his wife, Marie, bought the shop in 1998 and work together there as a family with their children Margaret and Andrew. The pot-bellied stove, 1911 hand-crank cash register, counters and wooden floors are all original. Leonard Rambo, the former owner, still comes in twice a week to help out, stuffing sausages and helping out with the meat deliveries. We partook in a sandwich, chips and some diet sodas (resisting the temptation for an ice cream cone), and sweated old-fashioned summer style on the store’s rustic porch. Other customers (including someone also with a dog named Bentley) were going in and out as we sat. It was good to see an old mom-and-pop shop thriving in the middle of our usually modern state. 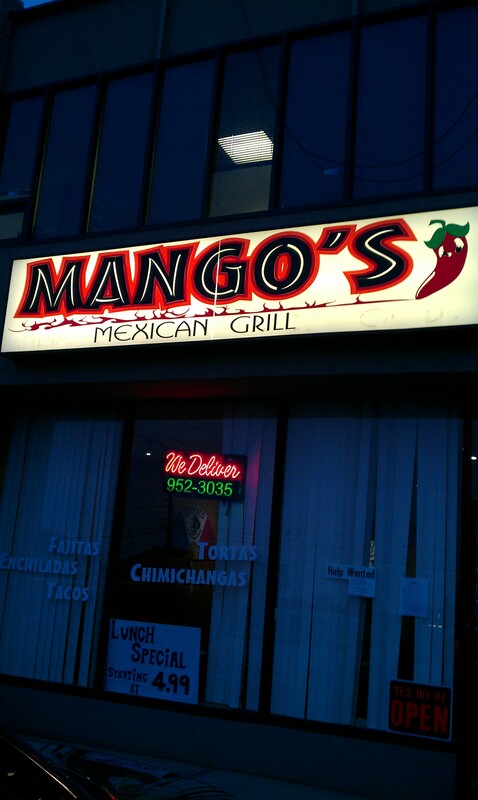 Mango’s Mexican Grill, tucked into a nondescript strip mall in Parlin, does a lot of takeout, but we bucked trend and ate in. The ambience is a bit on the dreary side, with old wallpaper that has been only partially removed, a few lonely tables and the TV volume fighting with an overhead music sound system. There is a reason, we learned, why most take out from this establishment. However, on the positive side, the service was friendly, the food was fairly good, and the prices were reasonable. The menu includes a few unusual choices, such as an Indo-Mexi fusion curry chicken enchilada, masala chicken fajitas, and mint-coriander sauce, which are nicely executed. Plenty of vegetarian options, and there is a liquor store next door for last-minute BYO. Not a bad stop. 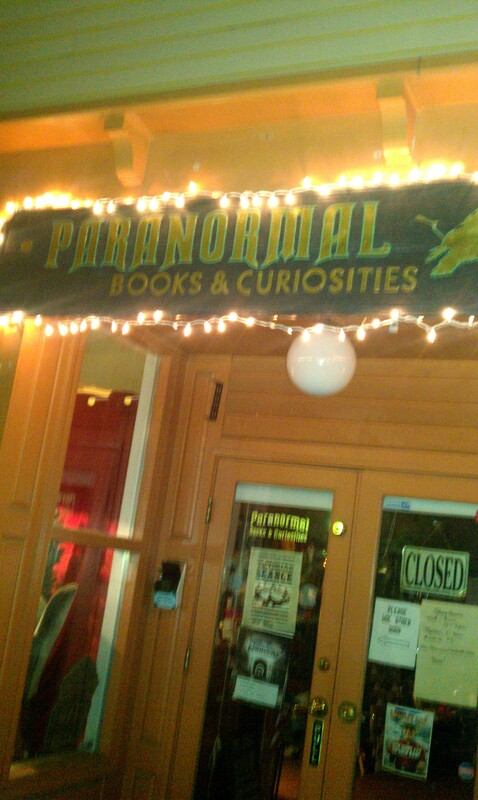 Paranormal Books & Curiosities by night…woooooo! Along the main drag in Asbury Park is a one-of-a-kind venue called Paranormal Books and Curiosities, a self-proclaimed “experience boutique.” This combination bookstore/museum/seance parlor is a quirky stop even by Asbury Park standards. The bookstore proffers a huge selection of paranormal titles and local lore as well as paranormal themed T-shirts and gift items (think Edgar Allan Poe bobbleheads, anatomical drawings of the Jersey Devil, zombie statuary, ghost hunting paraphernalia and so forth), and offsite ghost hunting services for those being haunted by a pesky relative or leftover resident spirit. The museum housed next door contains oddities like an Abraham Lincoln death mask, Jersey Devil artifacts, an alien under glass, videos of ghost encounters, explanatory panels about Haitian zombification, werewolf/vampire repellants, relics from the ill-fated Castle Morro ship and the like. There is a charge for admission to the museum–$5 to enter the museum, $13 for combination museum entry and ghost walk tour. We opted for the combination ticket, toured the museum (which packs quite a bit into a small space) and then headed off on the Ghosts and Legends Tour of downtown. Our spunky guide in shorts and Converse All Stars with a candle lantern was part of the ghost hunting crew and full of colorful stories about otherworldly encounters past and present. Among the tales were: screams of a drowning woman (a prostitute, natch) in the lake who sparks on occasion local residents to call 911, all for naught; the spirit of a little kidnapped girl in the boarding house-turned-pub who has run many a burly bouncer from the premises; residual visitors from the Castle Morro disaster; the Lenape Native American who walks through the intersection on Cookman Avenue near JFK Park; and more. There’s also a boardwalk tour, but we only had time for one foray that night. Although we didn’t have any supernatural encounters of our own (aside from the gorgeous moon that was out that night and more than once arrested our attention), the tour was lively and entertaining–well worth the $13. Recommended! In April 1905, Walter Graeme Ladd and his wife, Catherine (“Kate”) Everit Macy Ladd, began to buy up land in the area, eventually amassing one of the largest estates in the area at 1,000 acres. They named their estate “Natirar,” an anagram for the Raritan River that meanders for two miles across the property. In 1912, the 33,000 square-foot Ladd residence was completed by the prominent Boston architect, Guy Lowell, who is famous for a bunch of buildings like the Boston Museum of Fine Arts and New York County Courthouse on Foley Square in Manhattan, and Henry J. Hardenberg who designed Copley Plaza in Boston and the Plaza Hotel in New York City. Amidst this grandeur, the home incongruously was used by its owners also as a convalescent center for women, a purpose it served until 1983, when it was sold for $8.5 million to King Hassan II of Morocco, in accordance with the provisions of Mr. Ladd’s will. King Hassan died in 1999 and Natirar was inherited by his son, Mohammed VI. The property as it stands now is owned partially by the Somerset County Parks Department (the lower portions encompassing the fields and river) and Virgin magnate Richard Branson who is converting the upper portion (residence and outbuildings) into a high end spa resort. Behind the main residence, an imposing but partially crumbling structure becoming popular with the wedding planner set, is a chic restaurant called Ninety Acres with a huge wine selection and trendy dining options. 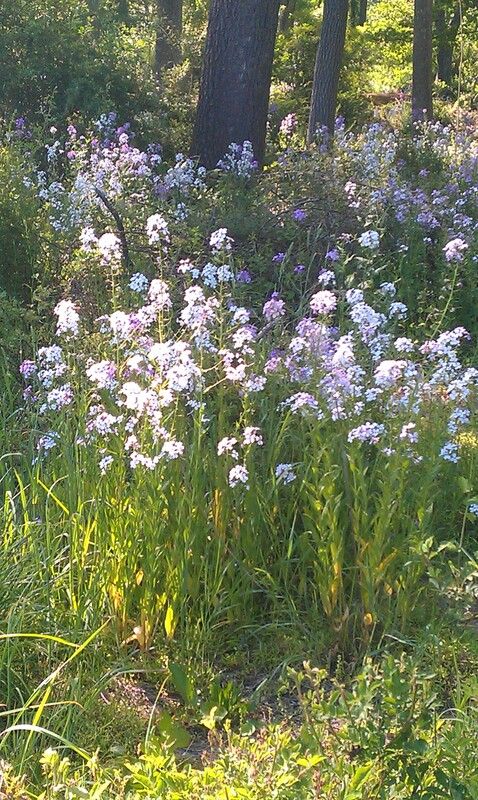 The Raritan River flows through the lower fields and offers a picturesque walk that leads up a hill to rear pastures filled with wildflowers and charmingly dilapidated barns and outbuildings. The path is dotted with benches for rest and butterfly watching. Like a Milton Bradley puzzle come to life, a train trestle is visible through the foliage of the surrounding trees. A totally peaceful spot. 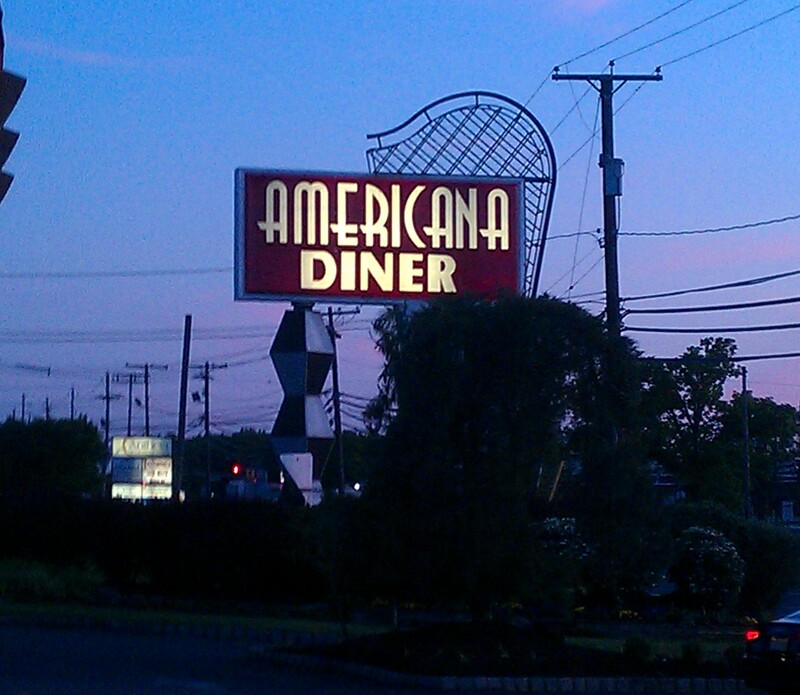 The anchor diner of the Americana group, this East Windsor treasure improves on the ubiquitous NJ diner experience with a gourmet flair. Owned by one of our old schoolmates, Constantine Katsifis (who we remember getting us in trouble in the 6th grade for talking out of turn), the menu is not quite as large as most diners, but what it may lack in breadth is made up for in food quality. Burgers (including veggie) are offered in about 8 styles, each more delicious than the next. The fries are old-fashioned, not coated, and perfect. The Greek salad is divine, with large triangles of piquant feta and plenty of vinegar and oregano. Don’t miss the Athenian Feta Crepe, which blends spinach, feta, tomatoes and basil into a thin, non-eggy crepe–served with grilled zucchini and tart tzatziki sauce. For an extra nice touch, as soon as you sit down, the waitstaff brings you a half-loaf of crusty bread and a never-large-enough pat of cold butter topped with kosher salt. The dessert case is filled with delicious looking cakes, as well as a unique selection of locally-made artisan chocolates, and there is a full bar. Yum.